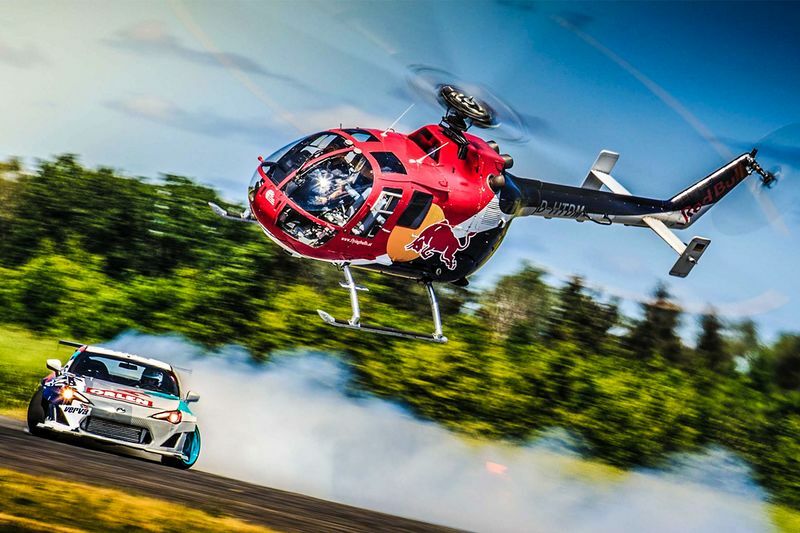 Aerobatic RedBull Helicopter and drift Toyota 86 have some fun on an airstrip. We have been in the automotive industry for some time now and along the way, some pretty wild things have been featured here on the pages of SXdrv. This time, we catch up with a situation that might rank up there among the top features. Watching two vehicles of completely different platforms battling in the same competition is always interesting to watch but when you take a drift car and match it with a helicopter that chases it around the course, you have an all new level of need-to-see programming. This had to be a blast for both drivers that were involved in this little tangle. We ride along with this show of epic proportions that throws these two into the gauntlet in a matchup like neither of them has probably seen before. This is most definitely a unique chance to go out and practice some of the more intricate driving manoeuvres for both of these pilots. Check out the video below and witness this one-of-a-kind battle for yourself and be sure to tell us what you think of this aerial meets grounded throwdown of adrenaline.